The Apple TV lets you stream all the video content in the iTunes Store to your HDTV, with purchases stored in the cloud. Netflix, Hulu, HBO, YouTube and dozens of other online services are available, plus music, videos, and photos can be streamed from iOS devices using AirPlay, which are all Apple TV strengths obviously. But are these enough for Apple TV? Surely not. 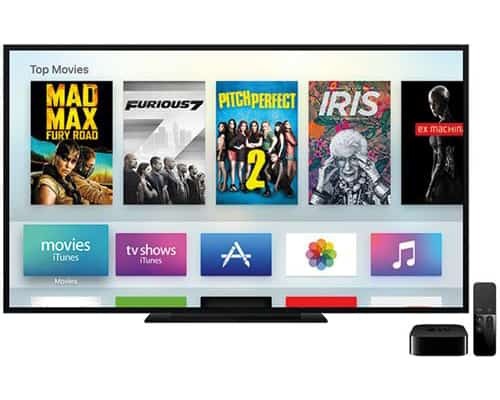 The new Apple TV 2015 was available on Oct 30, 2015, which turns disadvantages to Apple TV advantages on app store, Siri, remote control etc., enhancing a better users' experience of watching movies on Apple TV, playing games and so on. Apple CEO Tim Cook believes that the future of television is in apps. He made sure that everyone knew that apps were the key element of not only the hardware but its TV platform as whole...say hello to Apple TV 2018. The new Apple TV corrected the shortcomings that it lacks of app stores of old Apple TV, allowing users to search and buy apps from iTunes directly rather than via iPhone iPad devices. Apple announced four new operating systems at WWDC 2018 including macOS Mojave, iOS 12, watchOS 4 and tvOS 12. Even though there isn't any detailed information of this update apart from Amazon Video support, Apple fans have high expectation for tvOS 12. As is known to all, tvOS is based on iOS and allows for the ability to add apps and games to your Apple TV just as you do to your iPhone–through a dedicated app store. tvOS 12 also features Dolby Atmos audio, new Siri, iOS 12 integration, improved music apps and more. Earlier Apple TV models improved the Siri voice-recognition, fixing old Apple TV disadvantages on Siri. Basically, Siri now knows the content of what you are watching and searching for. At least, Siri has been powered up and now knows the difference between classic James Bond and the ones with Timothy Dalton provided that you don't have a strange accent. Besides, the new Apple TV 6 gets new Siri features like Find My iPhone, and additional new Siri knowledge of food, celebrities, etc. MacX Video Converter Pro - Download 4K ultra HD movies free from YouTube, Dailymotion, Myvideo etc. 1000+ movie sharing sites and convert 4K UHD movies to iPhone Xs/X/8/7/7 Plus/6S/6S Plus, iPad Pro/mini 4 and Apple TV for playback. No adware, malware. Apple makes high-quality products. That is what it has always done. The new Apple TV is no different. On top of the elegance, Apple has the leading app developer ecosystem in the world. It means that if the new Apple TV can prove that it is a substantial consumer hit, this developer ecosystem will flock to it, just like what they have done on iPhone iPad. 2. Bluetooth 4.0 wireless technology and 802.11ac WiFi with MIMO as well as IR receiver on top box. 3. Apple's intelligent assistant, Siri, which will rewind for you betterin seconds. 4. App stores are available on Apple TV 4 so that you can buy your desired apps on Apple TV without the help of iPhone or iPad. With all these Apple TV strengths, even if it's a little bit expensive, $149 for 32 bit and $199 for 64 bit, customers still have a lot of loyalty to this new Apple TV products. Apple TV, Chromecast, The Roku 4, used by almost customers to turn HDTVs into smart HDTVs . Largely speaking, they're cheap, easy to use and simply rest around the back of your HDTV, adding in tons of useful features like screen-mirroring, apps and streaming services. But it's a battle of video streams, Apple TV, Chromecast and Roku all want to seize the market. What Apple TV pros induce users to choose it instead of others? Nowadays Apple TV hitting stores, the tech giant continues to compete with Roku's similar device over who will dominate the streaming market. Roku still is one of the top choice of users. The latest Roku 4 deserves more attention. It has the similar remote which connects with the set-top box through the WiFi network, allowing you say it and steam it no matter with headphone on or not. 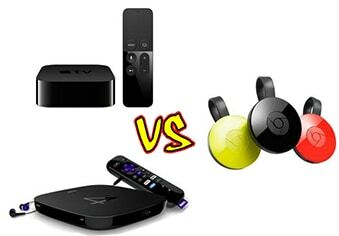 As for the advantages of Apple TV vs Roku 4, they both own nice streaming platforms like Netflix, Hulu, Google Play etc. 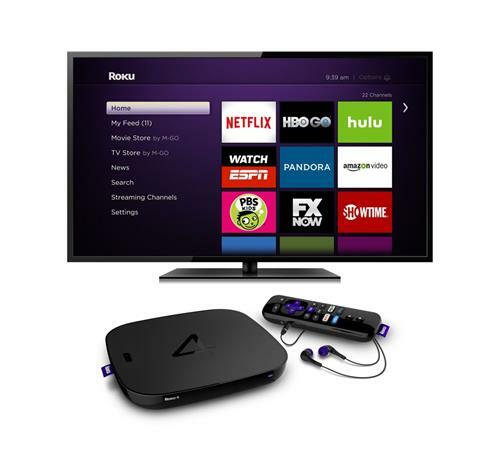 Roku 4 provides access to 2,500+ channels on demand offering 300,000+ movies and TV episodes, and the ability to search across more than 20 top streaming channels to find the best price and option. Stream DVD to Apple TV for family movie night. Compared with the pros of Apple TV and Roku, the biggest advantage of Chromecast is the cheap price, only $35. It looks cool, and for those who has already had Chromecast, update to Chromecast 2 for free is the best choice. 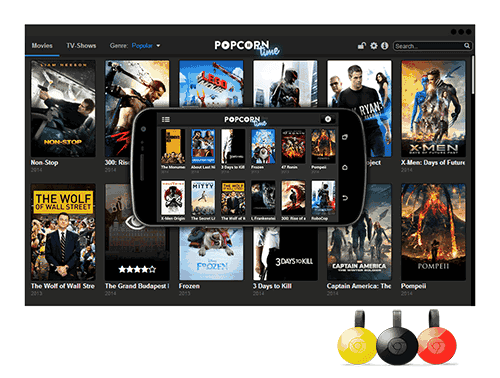 Moreover, it shows you a selection of the TV shows, movies, and YouTube clips available to stream video to your Chromecast. However, there still some disadvantages of Chormecast compared with Roku and Apple TV, for example, it has no interface. All the content you view on your Chromecast-connected TV is streamed directly from your mobile device. Still, The Chromecast doesn't include a physical remote at all. From the comparison above, we can clearly find that Apple TV advantages in watching movies and playing games. Thus even though the price is a little bit higher than Roku and Chomecast, costumers still have high loyalty for this Apple TV product especially for those who have already own other Apple devices such as Mac computer, iPhone Xs/iPhone X/iPhone 9/iPhone 8/7/7 Plus/6s/6s plus, iPad Mini 4 etc.